So, for the past year or so, I’ve had a secret side project. Technically, that shouldn’t be surprising. This is security. Everybody’s got a secret side project. Except my side project has had nothing to do with DNS, or the the web, or TCP/IP. In fact, this project has nothing to do with security at all. These are the Ishihara test plates. You might be familiar with them. If you can read the numbers on the left, you’re not color blind. You can almost certainly read the numbers on the right. That’s because DanKam has changed the colors into something that’s easier for normal viewers to read, but actually possible for the color blind to read as well. The goggles, they do something! Welcome to DanKam, a $3 app being released today on iPhone and Android (ISSUES WITH CHECKOUT RESOLVED! THIS CODE IS LIVE!). DanKam is an augmented reality application, designed to one of several unique and configurable filters to images and video such that colors — and differences between colors — are more visible to the color blind. [EDIT: Some reviews. Wow. Wow. @waxpancake: Dan Kaminsky made an augmented-reality iPhone app for the colorblind. And it *works*. Oh, and I used it today in the real world. It was amazing! I was at Target with my girlfriend and saw a blue plaid shirt that I liked. She asked me what color it was so I pulled up DanKam and said “purple.” I actually could see the real color, through my iPhone! Thanks so much, I know I’ve said it 100x already, but I can’t say it another 100x and feel like I’ve said it enough. Really amazing job you did. I went to a website that had about 6 of those charts and screamed the number off every one of those discs! I was at work so it was a little awkward. Just found this on BoingBoing, fired up iTunes, installed and tried it. Perfectly done! It WORKS. Not perfectly for my eyes, but still, it works pretty damned well. I need a version of this filter I can install on my monitors and laptop, asap. And my tv. Wow. That is so cool. Thanks for sharing this. Wish I could favorite it 1000 more times. As a colorblind person I just downloaded this app. How can I f*cking nominate you to the Nobel Prize committee? I am literally, almost in tears writing this, I CAN FRICKIN’ SEE PROPER COLORS!!!! PLEASE KEEP UP THIS WORK! AND CONTINUE TO REFINE THIS APP! Why is some hacker working on vision? Well, “why” has a fairly epic answer. But I was not yet done with him. See, before I got into security, I was a total graphics nerd. (See: The Imagery archive on this website.) Graphics nerds know about things like colorspaces. Your monitor projects RGB — Red, Green, Blue. Printouts reflect CYMK — Cyan, Yellow, Magenta, blacK. And then there’s the very nice colorspace, YUV — Black vs. White, Orange vs. Blue, and Red vs. Green. YUV is actually how signals are sent back to the brain through the optic nerve. More importantly, YUV theoretically channelizes the precise area in which the color blind are deficient: Red vs. Green. Supposedly, especially according to web sites that purport to simulate color blindness for online content, simply setting the Red vs. Green channel to a flat 50% grey would simulate nicely the effects of color blindness. A color blind person telling me about red? That would be like a deaf person describing the finer points of a violin vs. a cello. I was flabbergasted (a word not said nearly enough, I’ll have you know). Ah well. As I keep telling myself — I love being wrong. It means the world is more interesting than I thought it was. There’s actually a lot of color blind people — about 10% of the population. And they aren’t all guys, either — about 20% of the color blind are female (it totally runs in families too, as I discovered during testing). But most color blind people are neither monochromats (seeing everything in black and white) or dichromats (seeing only the difference between orange and blue). No, the vast majority of color blind people are in fact what are known as anomalous trichromats. They still have three photoreceptors, but the ‘green’ receptor is shifted a bit towards red. The effect is subtle: Certain reds might look like they were green, and certain greens might look like they were red. HSV, for Hue, Saturation, Value, is fairly obscure. It basically refers to a pattern of computing a “true color” (the hue), the relative proportion of that color to every other color (saturation), and the overall difference from darkness for the color (value). I started running experiments where I’d leave Saturation and Value alone, and merely quantize Hue. Suppose you’re in a dark environment, or even one with tinted lights. You’ll notice a major tint to what’s coming in on the camera — this is not the fault of DanKam, it’s just something your eyes are filtering! There are two fixes. The golden fix is to create your own, white balanced Light. But the other fix is to try to fix the white Balance in software. Depending on the environment, either can work. Feel free to move the slider left and right, to “tweak” the values for your own personal eyeballs. There are multiple filters — try ’em! HueWindow is sort of the brute forcer, it’ll only show you one color at a time. Size matters in color blindness — so feel free to put the phone near something, pause it, and then bring the phone close. Also, double clicking anywhere on the screen will zoom. The gear in the upper left hand corner is the Advanced gear. It allows all sorts of internal variables to be tweaked and optimized. They allowed at least one female blue/green color blind person to see correctly for the first time in her life, so these are special. Really though, not being color blind I really can’t imagine how this technology will be used. I’m pretty sure it won’t be used to break the Internet though, and for once, that’s fine by me. It is possible to emit a “cleaner signal”, such that even colorblind viewers can see colors, and the differences between colors, accurately. If there’s interest, I’ll write up another post containing some unexpected evidence for the above theory. Very interesting. I don’t have an iPhone, so I can’t try your app. I am, however, colour-blind and I can definitely see the use in having something that I could tune to my deficiency and use to try to get an idea of how others might be seeing clothes/paint etc. in terms of their dominant colour characteristics. Colour-blind snooker players would likely be very happy to have something that stops them potting the wrong colour or cueing up on the pink ball too. From a marketing standpoint, I think it would be good to have some real-life examples. Obviously you might need to get some colour-blind people to help you there. This is why I keep the Visolve Deflector app on my computer. Oh yeah, seeing thin red or thin green lines is always a trouble for me as well, which is a shame, because math and science teachers love using those two colors in graphs and examples. It’s fine until they start using them to show distinction between lines that intersect. Then I just lose all track of what’s going on. Yep, fine red or green lines are difficult for me to see. That XKCD graphic appears to me at first glance as black and white only. The red does not jump out enough that I notice it, it just appears grey, not much different from the black lines. After being told that there is red, I can, if I lean in and look very carefully, pick out the red lines. I understand that this is not atypical for red-green colorblindness. The particular shades that cause the most trouble in these conditions are the ones that fall on the lines of confusion; for some reason I seem to run into a lot of charts that use easily confused reds and greens. A cool toy to have. Curious if one could run the app in reverse, simulating to a non-colourblind person how colourblind people see things. I know this exists already for computers but it could be useful as an iPhone app as well. Actually, one of my findings is that *all* the color blindness simulations are desperately inaccurate. They just don’t represent what the color blind are seeing. As a colour blind Android user, I really REALLY want this app. Please, pretty please don’t let the Android app become vapourware! Thanks! Just bought it. And… HOLY CRAP I CAN PASS AN ISHIHARA TEST! Woohoo! Really want an android app as well. I suspect I could implement this in OpenCV and use it with a webcam and a netbook. In any case this would be a godsend. I have an iPhone and do suffer from color-blindness. This is an interesting use of technology. See the funny thing is, I’ve never met a single deuteranope, but I’ve met about 50 anomalous trichromats (including a blue/green female!). These simulators are taking the cheap math path…but they weren’t good enough for my dev efforts. The biggest thing I could use are sample pictures of things people wish they could see, but can’t. My issues are not being able to appreciate the fall colors (in New England) and being unable to pick ripe raspberries. However, if I take a photograph of the fall colors, then it looks much better on the screen than in reality. I suspect that this is due to the wavelength quantization that is happening during the image capture phase (i.e. there are only three channels being captured rather than the continuous spectrum). Also, the red traffic lights in England are very close in color to low pressure sodium streetlights — which can make for hazards when driving. I haven’t tried photographing these to see if the differences show up. I have a GREEN image that was corrected by a photo lab before they printed it. I cannot see the grossly GREEN color cast; the lab told me about it, or I never would have known. Since the print was going to other people, it would have been very embarrassing had I delivered it. Would you like to see it? What size/format do you prefer? How do I proceed in getting it to you? I don’t have an iPhone, am not color-blind, and am not trying to SEO any real estate websites, and I think this is an awesome use of technology. Congratulations. Android build is done, just having some headaches with Checkout. And yes, being color blind blind (meaning I’m blind to what the color blind are blind to) has made building DanKam amusing. Amusing story– in the early days of Star Trek in the 60s, they doused the actress in green paint, but when the film was developed she looked totally normal. So they reshot everything, made her greener, and the same result. They did it a third time, same thing, and determined it wasn’t possible to make her any more green. So, they called the film lab and learned that the poor developer had been working overtime every night trying to fix the ‘broken’ color in the film they’d shot; painstakingly turning the green girl back into a normal color. Actually the opposite has occurred I knew a meticulous color photographer who shot a MacBeth Color Chart every other frame and did his own color negative processing. He then sent his negatives out to a service bureau with video preview enlargers. Despite all this he suddenly started getting horrible prints back. After working through each stage he ended up discovering that the guy running the video preview enlargers was color blind! I didn’t think there was a Star Trek story I didn’t know…thanks! bjarne: I don’t know if you’re in the US, but if you are: I was under the same misconception. I have red/green colorblindness too but that doesn’t mean you can’t fly. The worst is that you’re restricted to daytime flight, but it’s quite possible to pass the colorblindness test even with red/green deficiency — I did. Various wiring harnesses. Maybe people can send in examples. I’m forwarding this to someone, so perhaps I can send in some photographs in a couple of weeks. It is relevant to subject… sorta. colorblind. He had ‘issues’ with clothing matching. It was a new concept to me. I had never met anyone with it. This is great. I recently discovered, after years of graphic design that I’m color blind. Talk about shame! This is definitely an awesome step. OK, I’ve got you all beat. My name is Ray and I’m colorblind. U have been a freelance artist for twenty-five years. I tell very few about my condition. The entire world is based on the supposed universal color language that all are supposed to speak. I can’t use any paints that are not labeled because I can’t tell the difference in many cases. Boy could I tell you stories! I’m anxious to re-read about this app and see if it can help me. If you’re interested in a real hardship case for further exploration, let me know. I’m “chromatically challenged”. It’s something I live with, and I treat it as a bit of a joke, but sometimes, it does get in the way of having fun. This is a very clever hack, Dan, and thanks for thinking of it. A fine example of how popular technology can be used to make life just a little better, in ways that the original designers probably never even considered. I am a color blind web developer / GRAPHIC DESIGNER. This technology is like hearing a prosthetic arm could replace that useless nub where your shoulder should be. I need this product on my PC, and will donate money. Holy crap. I thought I was the only one in captivity! I’m a professional graphic designer and while I can get by most of the time I’m hoping this will be a help. So far I don’t quite understand how to calibrate it to my red/green issues. Its shifting reds to greens so violently on my iphone at the moment even I can tell its wrong. Screens and printers being so wildly uncalibrated has always been my saving grace. My colour blindness is minor compared to that. I can just give a client pantone books and tell him to choose the colour and trust to that. I also use photoshop’s eyedropper a lot! The “Advanced” dialog (click the gear) gives you lots of opportunity to tune to your particular vision. This sounds really interesting, I cant wait to try it out. Brilliant! I’ll get this for sure when it comes out! I’m pretty badly colour blind (and also a web developer & graphic designer) and I even had a contact lens to correct my colour vision in the past (which was an interesting but pointless exercise). I’ve just tried DanKam out on quite a few colour blind test cards and with a lot of tweaking I can see the things that people with normal vision can see. But I’m not sure whether it’s a true representation or just setup for those cards (if I could find my contact lens I’d do a side by side comparison). One thing I did notice with the contact lens was fluorescent colours really pop out at you but with DanKam I didn’t experience the same thing, an interesting play thing and I think it will at least help me determine if the lights on a couple of my gadgets are green/red/orange (why they use these 3 confusing colours on one light to denote status is beyond me). Wow. Now there’s three designers here admitting to colour blindness. I must admit this is a closely guarded secret with me, mainly because of misunderstanding about the problem. – ever heard the phrase “you’re colourblind? what’s this colour (probably holding up something bright yellow)”. How did you set it up with the cards? I’m still a bit clueless about how to use this app. I enrolled in an art program, specifically for the purpose of taking the studio classes. The one class I had my heart set on won’t let me enroll because I’ve not taken “color theory” -so I explained to the instructor why I hadn’t. Not only can I not take the class, the professor is really condesending to me whenever I see ’em (and continually asks me stupid questions). Lucky you actually made it to your dream job. I’m quitting this route after this semester. Wish I had an iPhone, or could use it in class. Never tell anyone you’re colorblind- it never helps! I can tell you exactly why status LEDs are green/red/orange: Because green and red LEDs are cheap, and you get orange by mixing those. Blue LEDs are really expensive, so the colors that get used are predominantly “whatever you can make mixing green and red”. Dan, as in iPhone app developer I had an interesting thought as I read your article. I have a friend who is color blind (red-green) and there are some apps (particularly games) that he simply cannot use because the color distinction is important. Your results presumably mean that any app could be changed to use colors that are correct for a particular color blind person. If an app applied the same corrections that you do to the colors that it uses, the app should look normal to a color blind person. I was envisioning a framework that any app could include. The framework would maintain the correction information that would be required to convert any color to a corrected color. 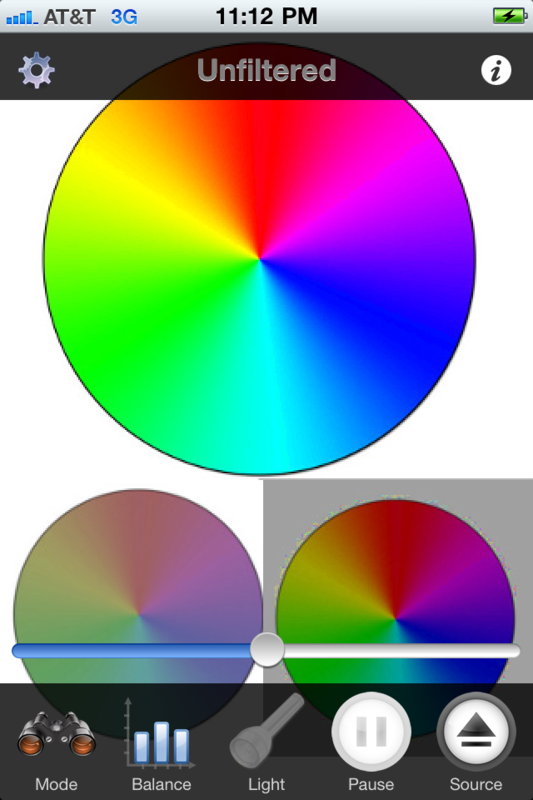 Any time that the app wants to create a color by specifying RGB, they would use a method in the framework. In most cases the method would simply return the RGB that was requested, but if there was correction information available it would correct the RGB values that are returned. When the app is launched, the framework could check to see if there is a copy of DanKam installed on the device. If there is, it would get the correction values from DamKam and store them for applying the corrections. This should not be too hard to do, and it would provide a great service. For very little effort, any app could provide an interface that is color corrected for the users specific color problems. You would presumably sell a lot more copies of DanKam if it provided this extra functionality. that would be FANTASTIC! There are so many games that I am unable to play because the difference in color is crucial to the game, and, unfortunately, the colors chosen are ones I can not see. And I’ll second (or 3rd or 4th) the “i wanted to be a pilot but couldnt because I was colorblind” statement. I’ve already pointed this out in this thread, but the “can’t be a pilot thing” is a myth. As a private pilot you’re restricted at most. As a commercial pilot you may not be able to fly at night (and, it follows, an employer may not want to hire you because of it,) but if you can pass the tests you have no restrictions. FAA rules do not completely disallow you from getting a certificate if you’re colorblind. WOW!!! That would be one of the most amazing things to happen to the iPhone! Maybe even sell your code to Apple and have them implement it into the iOS software! Then all a user would have to do is go into the settings and flip on the “color blind” tab! Oh my gosh, that would be great! Do you know that there are more color-blind people in the U.S. today than the entire active-duty-military roster that won for us World War II? It’s true. It’s about time that big business learn of the sales opportunities they are missing by ignoring them. I would be very intereste in a symbian version of it.Are you planning on doing one? i am a deutoranomalous (green weak) colour cripple scientist. In my field people are always using red and green on graphs and in particular microscopy images. I would love it if you could test you app on red/green fluroescent images. this could open up my things i could never have seen before. i am knocked sideways. People are always askign me what i can’t see which is like trying describe something you have never heard. the whole point is i don’t know what i am not seeing and in scientific papers and in particular talks at conferences, it can be really important stuff. i often have to have a friend describe a graph or image to me. here are a couple of examples. if i can help get in touch. Have you tried red/green anaglyph glasses? The green lens shows green as bright and red as dark, and the red lens the opposite. That should bring up the colour differentation quite effectively. Cheap cardboard glasses only cost a buck or two. Dan, I hope you don’t think I’m trying to undermine your business, your app seems fantastic! I’m not colourblind myself, but I’m going to recommend it to my CB friends! Someone had that idea for the gadgets — just put the cellophane over the light. As someone who is colorblind, I am VERY excited about this app. I used to teach Photoshop (yes, a colorblind person taught photoshop – it’s all numbers once it’s on a computer) and I always wondered if it would be possible to do this. Glad to see someone who has the know-how was able to put it together. I will DEFINITELY be buying this app. VERY anxious to see how well it works. Thank you so much for building this. I have been dealing with this my whole life. I will purchase the android app when you have it ready. Waiting anxiously for the Android version as well. It’ll be nice to see if a battery is charged without asking my wife. Or if that flashing light in the middle of nowhere is flashing red or flashing amber. I’ve suffered with this my entire life, and it even kept me from pursuing a career as a pilot. It also makes picking out clothes very tough. Blues and purples tend to be similar at times. I would love to try your app on my iPhone 3GS, but I’m hesitant to buy it without demoing it first to see if it actually works. I find this project very intriguing though and would love for this to work for me. I didn’t read your post until just now. I’m in the exact same boat with GFX and video and color correcting is a b**** for me. I usually just memorize the color values but it’s a hassle. And I too wanted to be a pilot. Glad to see someone else in the field. My TV station uses a lot of blue and being their promotions and graphics guy, I’m always having to verify to make sure I’m not putting purple in our logo. That’s relly helpful thanks. is there a way of seperating and showing just the yellow? the problem i have is seeing all the yellow. this is usually the point of the images. frustratingly it is easily fixed by using magenta instead of red. also i’ll have to try and find some crappy red and green graphs for you too. i can imaging having a version of this on my coputer where i could use it to “fix” the figures in paper is was reading. being able to switch it on and off and seperate out the colours like you did in those image would be great. thanks for looking into this. And we’ve found our first bug! Looks like Select from Library isn’t shifting reds to a canonical red or greens to a canonical green. That it’s helping at all is sort of surprising! Here’s an actual camera shot. How does this look, guys? That one is very easy for me to tell the reds from the greens. Almost impossible in the first of the four on #32, and better than any of the other three on that list also. OMG! I can actually see the red and green!!! *PLEASE* get the android app version out soon!! that definitely brings out red stainign taht i hadn’t noticed before. the earlier pics just seemed to make what i could see stand out more. i think this is a good example of i don’t know what i’m not seeing. Oh this is so great! I’m one of the comparatively few colourblind women and I’m so going to download this the instant I get in and plug my iPhone in (my battery died or I’d be downloading it now!). I so sympathise with some comments on this thread. I wanted to be an interior designer, which isn’t condusive to colourblindness. My art classes were a mess, I’d get asked ‘why does the horses neck turn from brown to green halfway down?’ ummmmm . . .’cause I remixed the paint and thought it was the same? Plus, no more stopping shop assistants to say ‘Excuse me, I’m colourblind, could you tell me what colour this is?’. Hurrah! Just got the app (saw Make magazine blog) and I’m very impressed! I’ll use it a bit more and send feed back. Next stop: active filtering in my eyeglasses! As a protanope, I’m wondering if this will work for me? (at least once it is on Android ;)) As far as I can tell, I can’t actually see red at all (or at most very weakly) at least from the feedback given by my wife. This would seem to be borne out by the event when we had a failing monitor with a broken red cable, and I had happily used it for a week without noticing the fact 😉 – until my wife returned from a trip away, that is, and asked why the monitor kept flashing at her (as the broken wire made and broke contact). I agree with the comment that it would be nice if all graphics frameworks could have a “colour blind” mode that would automatically invoke your own personalised colour correction profile. Plus an end to the irritation of people using red/green leds for charging – at least make them flash in one state. As a protanope, I’m wondering if this will work for me? (at least once it is out on Android ;)) As far as I can tell, I can’t actually see red at all (or at most very weakly) at least from the feedback given by my wife. (Apologies if this is posted multiple times, but I seem to be having problems posting). I am a protanope and it works for me. It’s not perfect but it’s an amazing start! I will need to get an iPhone or iPod touch to try this out. See, I’m colorblind and I notice that you said you aren’t sure what the uses could or would be. I’m a television broadcasting student and also a graphic designer. Or at least I try to be. But being R/G colorblind I run into a lot of problems with purple/blue and lime green/yellow. I’ve taken to memorizing color values and a reference sheet. thanks for this Dan. Firstly this is just the best start to my day – discovering I’m not the only colourblind designer in the world. Its a well-kept secret with me as people don’t understand how subtle it is and simply wouldn’t employ me! I’ve just bought the app for my iphone but can you tell me how I set it up? Under source do I set up the ishihara images to see the top or bottom or both? Having done this have I now calibrated it for my eyes so switching the source to camera will now correct? I’d set Source to Ishihara 1, and Mode to Unfiltered. You should see nothing. Then set Mode to HueQuantize. You should see both numbers. Same with Ishihara 2. If you aren’t seeing numbers, shift the slider a bit to the left or right. If STILL not seeing numbers, then try switching to MaxS+HQ. b) Go to the gear in the upper left and start moving my boundaries around. Dan – I am having trouble seeing b/c I’m in tears. Sure, this isn’t the world like normally-sighted people view it – but it’s not just shades of grey, either. You have no idea what you have done for me with this. I am deeply grateful. I’m cured! I’m cured! Well, actually trying out the iphone version now, and not entirely clear to me from the description how to adjust it, and especially how to tell which of the filters is actually giving me the truest color. In the Ishihara plates at the top, by the way, the filter works perfectly with the upper (45), and something stands out a lot more on the lower circle (6? ), but not clear to me. Will leave another replay after having played with the app… Actually, just tried removing my glasses and looking at the plates, and now does look distinctly, if not clearly, like a 6. Interesting! Please let me know how things go with real world content! Just downloaded this and it is a very cool app! Seems to be well-designed. I have a similar tool on my computer, but having this one in my pocket is pretty amazing. Application-wise, what comes to mind immediately: red/green leds, colored harness wires for electronics, reading pie/bar charts, and boardgames where the colors are indistinct. Off the topic, but for all of those people that said that they wanted to be pilots, in most countries (I cannot speak for all of them), color blind people CAN be pilots, they are just restricted to NOT flying at night. This would preclude a professional career as a pilot, but would not preclude flying as a hobby. I personally know at least one color blind pilot. I’d love to know more about what they’re unable to see! The reason for not being able to fly at night is due to the way we identify other aircraft and their direction of flight at night. Aircraft have several sets of lights, one of which is the navigation lights that sit on both wingtips and the top of the vertical stabilizer. The lights are all different colors, the right wing is green, left red, and vertical stabilizer is white. By looking at an aircraft at night, you can tell it’s direction of flight based on the colors you see. If you are unable to reliably “see” those colors, then you can not determine their direction of flight. I don’t believe the colors of flight instruments or switches in the cockpit would be a huge deal. This isn’t so much a capability issue as it is a certification issue. The FAA won’t grant a medical certificate to people with most types of color blindness, which prevents you from holding a license. Notice I said “most types”, many people just assume that being colorblind makes them ineligible for a pilots license. That is not true. If you have a good AME and are motivated enough to go through a substantial review process, you may be able to get a medical and as a result a license. I’m also a colour-blind pilot. I’m told the reason I can’t get a night rating is not the port/starboard colours but the possibility that the tower has to shine light guns at me. It’s really annoying because if they used a single colour (white) light gun with different patterns of flashing, everyone would be able to see it. But the insist on using red, green and white guns and, as I have no green receptors, I can’t distinguish between the white one and the green one. Hmm. Are there other assistive technologies for pilots? @Chris, I’ve heard that reasoning as well, however I don’t believe that is the cause of the night flight restriction since light guns can be used during the day as well. It’s also possible that airport lighting plays a factor as well. As for changing the light gun signals, I don’t think that’s feasible. They can mean a number of different things that can’t all be represented by one color. In the US they are largely used in the event of a communications failure, I don’t think they are used as a part of standard operations anymore. I don’t know the colorblind medical process that well, maybe someone can elaborate more, but my understanding is that if you wanted to fly, you can get a medical with a no night flight restriction on it. If you wanted to eliminate the restriction, you can take a fairly standard test to prove you are capable of operating safely with your colorblindness. Remember that some AME’s (medical examiners for the FAA) are good and others are not, meaning some will put forth the effort to get you certified, even if they think it’ll fail, while others will just tell you not to bother. I encountered this getting my medical to a large degree. My original AME barely put forth any effort (and he was PAID), but the second one I used put months of work into getting me my medical and refused to take payment. This was all due to a condition that was misdiagnosed 20 years ago, by the way. If you need more information, join the AOPA and hop on their forums (forums.aopa.org) and ask in the medical board. The doctors there are responsible for a large number of people being able to fly today and can give you very good advice. Not that I’m aware of. The FAA is really picky about aeromedical stuff and certification of devices to be used in the cockpit is even more stringent. @JK. No, certainly here in Canada it is to do with light guns (apparently). My commercial licence has a restriction that says I must have a working two-way radio when in a control zone by day. As I say, if they used a single colour gun and used different cadences then presumably there would be no problems for anyone. Total aside: where can I get one of those “I ❤ COLOR" shirts you're wearing in the Forbes photo? I covet! I’m doing some fairly wonky stuff to color, but you’re right, we can’t do this digitally with glasses yet due to limits on latency and focal length. Anything complicated with analog is still too hard though. Looks like very nice work; I eagerly await the Android release. I’m protanopic (no L-cone), so let me know if I can help you test anything. Maybe less interesting than the subtle cases though; to me your second green-girl picture does look essentially the same as the first. I have source code for a very similar side project on Android, but I found that the camera preview infrastructure in Android was really half-assed and broken, so I presume you had to write some low-level code to get it working? Or is your application not a real-time thing? Sounds like you put a lot of flexibility options into the app, which is great. I think it would be really nice to try to release a general pixel manipulation app that would allow flexible filters to be programmed on top. I am a vision scientist, so would be interested in discussing the theoretical side of this more; feel free to PM me. 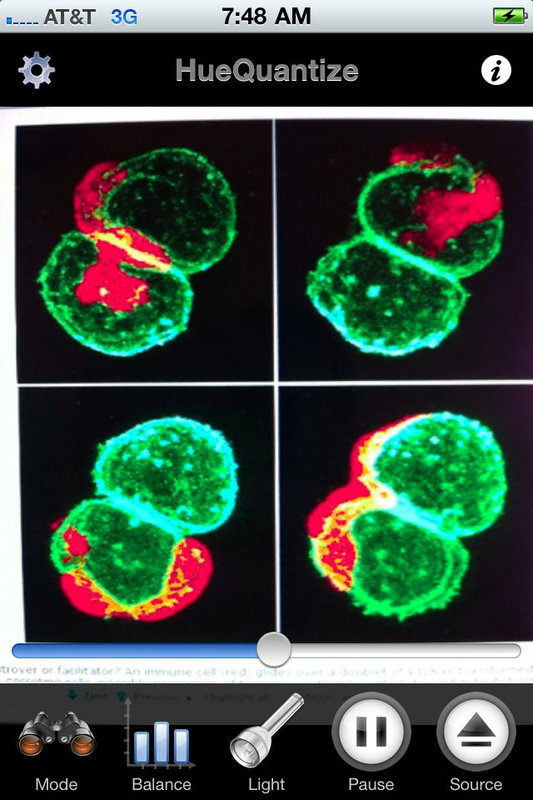 Also as a scientist I have problems with the same kind of red-green merge images that the other guy brought up. In the past I’ve dealt with this by copying the red channel into the blue channel; these kind of crude manipulations can be quite effective for controlled inputs. Another thing I have big problems with is that without an L-cone, reds are very dark to me, so that red lines on a line plot look the same as black lines. This is another case where just trying to enhance the contrast may not work as well as a simple, crude copying of red into the blue channel, e.g. Peter – The firefox plugin is not available for version 3.6.13. At least that’s what it says on the download page. I didn’t try to install it since it said unavailable. Are you running 3.6.13? If so, I’ll go back and download it. That plugin is dead, like the other user mentioned. I have their filter in my code, it’s the Daltonize mode. It doesn’t work that well, at least in my testing. awesome analysis and app – I’m a windows phone 7 user, maybe one day we can get your app too! Great! My two sons are colorblind and I was just talking about writing an app like this last week with my wife. But you’ve done all of the research and work, so thanks! Squeeeee!!!! OMG plz post update when Android version is in the market! Will buy immediately, kthxbai!!! Dan, I have longed for the day when I don’t have to ask strangers in shops what colour the shirts are, or see a rainbow with more than two colours. This tool by itself makes it worth the money buying a new phone – none of the tools I’ve tried before have been satisfactory. Does the Android version do real-time augmentation? Yes! And it’s finally out. I found out I was red/green after college when I failed the Ishihara test. It never affected me before. I have no problems with red/green wires. I’ve since found I can’t tell the difference in a red/green LED. As a sysadmin/network guy, that can be an issue. I usually do remote admin, so a light or buzzer just doesn’t matter. FWIW – traffic lights use position as well as color. The shades they use look distinctly different to me. I’d love to have some kind of lens I could carry that would block the greens & just allow the reds to shine. From a quick google, 6-10% of the male population has this colorblindness. I’m not colour blind, but I find this idea really cool. In my eyes (excuse the pun), the next logical step is to start talking to the major graphics card makers (say ATI, NVidia, and intel) to get this tech into their drivers. I imagine this would be awesome for designers and gamers the world wide. Wow. Just downloaded the iPhone version and have been playing with it. I can finally see those $#*($ numbers in the Ishihara plates! I have difficulty differentiating between some reds/greens so mistake blue for purple, etc. However the most maddening thing has been the amber vs. green ‘LED’ status lights on equipment. Now, I can differentiate them. For that I thank you! Colorblind user here… Just purchased your iphone app. Thanks, this is a super cool idea. I can’t wait to see what more I can do with this beyond looking at a simple Ishihara test plate. If nothing else this’ll be an interesting party trick app. 🙂 You’re welcome to contact me if there’s a way a colorblind user can help make the app better. I love this, and I am glad that I found Daniel Hoherd’s picture set because of it too. +1 for the Rainier Wolfcastle reference! This is amazing. Nicely done! Nifty! Says another guy who never knew there was a green girl in the Star Trek movie until people started talking about her. I only wish I could get video glasses that would do this correction in real time across a card table. Unless the light is real bright, the red and black pips on the cards all start to look the same color after a few hours at the table, and as my eyes get tired, telling the suits by shape gets harder and harder. This is very cool… Could be outside the scope of this project, but any chance you could add an “identify color” feature? Not unlike a video camera’s zebra stripe function for blown highlights, I’d love to see stripes on “only green” or “only red.” Or some way of visualizing (even numerically) if something is red, green, brown, etc. Maybe an outline of the area, like MaxSV mode, but with a small bar chart showing the RGB values? Imagine being able to verify the color of a pair of socks or a shirt, for example? I second the request for some way to help with color identification. 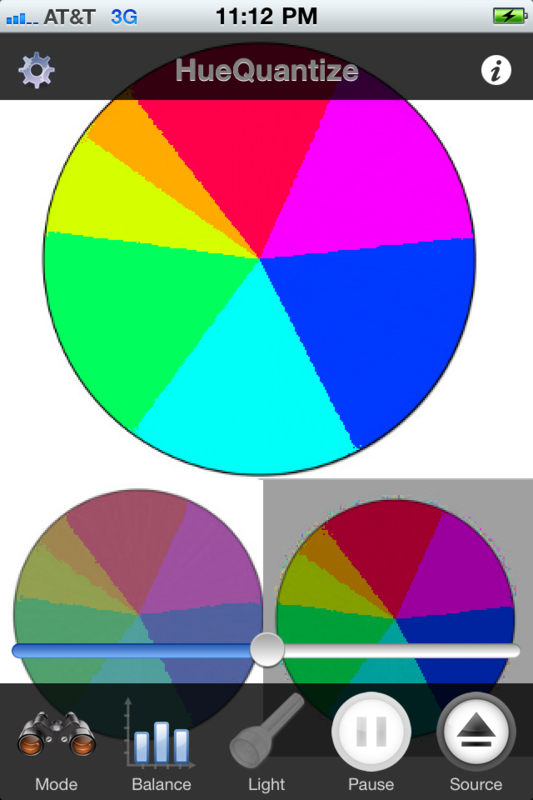 What about an option to overlay a small color wheel? At least then there’s some reference for understanding how the colors are being shifted. I was actually kind of surprised to see how red the santa was on my Christmas tree. Thanks for getting the android version working. Why are there two apps on Google Market? And which do I buy? If your phone is old, 1.6. New, 2.0. Old as is speed, or old as in Android version? If it’s speed, then I need the 1.6 version I guess. If it’s the android version, then I can use the 2.0 version. Off the shelf, the phone ships with 1.5 BTW. In the last month, a 2.1 upgrade was made for it. Any chance you could make a Windows app that does this??? I’m a colorblind graphics designer, this would be very useful. Something where I just hit a hotkey like CTRL+ALT+F12 or something to toggle the color fixer. People would totally pay for a program like that! Try the free Visolve Deflector app. This is great. Now I can make sense of those awful green/red heat maps that the biologists are so overfond of presenting! Thank you, thank you! (1) The app seems always stuck in portrait mode, irrespective of whether the keyboard is open or which way the phone is aligned (the phone has an accelerometer and other apps switch OK). (2) Worse, if I open or close the keyboard while the app is running, it crashes hard. I have to power the phone all the way down before I can launch it again. (3) In portrait mode (which appears to be all there is, as I note), the icon bar at the bottom shows only ‘Mode’, ‘Balance’, ‘Light’ (which is greyed out and might as well be removed if the phone doesn’t have a flash, as mine doesn’t), ‘Pause’ (which I presume is the function that’s labeled ‘Freeze’ in the documentation?) and a slightly truncated ‘Source’. I presume that the gear is ‘Advanced’ and the “i-in-a-circle” is ‘About’? Are all the remaining settings on the ‘Advanced’ screen? (4) Count me in among the users who would like to have a mapping of red-to-magenta available (it could be as simple as B=B+R). 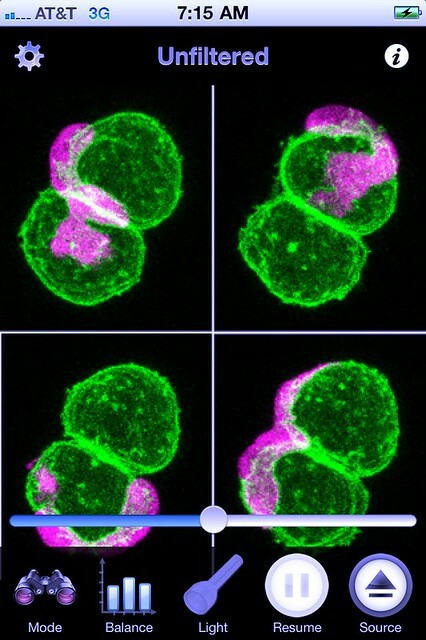 As I and others have observed, the biologists just *love* images that are in two colors, with red indicating the intensity of some sort of marker and green indicating the intensity of another. I can quite easily read ones that are red-cyan or green-magenta (with the latter preferred) but the red-green ones (with various sorts of browns and yellows for things that express intermediate levels of markers) are quite beyond me! With your interest in this area, you might find http://www.wendycarlos.com/colorvis/color.html an interesting read, particularly part 3 on color deficiency. It is nice that Carlos recognizes that we “color-blind” folk still inhabit a rich world of color – it’s merely a *different* world of color. 3) We’ll fix the truncation. Yes on your i and advanced question. 4) It’s super slow on android, but can you tell me if Daltonize is enough? 5) I’m not a fan of this, but I see the demand. I’ll try to get it into a future release. Thanks! Would love more feedback, and especially samples images that confuse you! which I find *immensely* easier to read. I certainly find that the ‘Daltonize’ setting is useful for reading these red-green (+yellow, orange, brown, chartreuse, whatever, all those shades that I don’t see!) abominations. But I haven’t found a setting on its slider that gives quite this. Hmm. Can you try Unfiltered, with various settings of hue rotation? I’ll definitely build something for this precise scenario. This really is remarkable – I’ve only had my iPhone a couple of weeks, and I never thought that it would be able to help me so quickly in this way 🙂 I am red-green colourblind, and found that the “HueQuantize-RG” setting set to just below centre did the most for me. Though I knew that I shouldn’t expect miracles, I set it with the Ishihara 1 slide so that I could make out the two numbers, then switched to the Ishihara 2 and was… sort of disappointed at first, because I could just about see what the numbers were, but it didn’t seem to do anything that I couldn’t accomplish by squinting. Then I changed the filter on that slide to “Unfiltered”… and the numbers completely disappeared. It wasn’t that the filter just enhanced them slightly – I wouldn’t have had a hope of seeing what they were without the filter. So I’m very impressed – thanks for your efforts, and for explaining your methods! It will certainly help me not to miss any more green-skinned space women (a problem that your original consultant wasn’t alone in experiencing). COOL! Thanks for letting me know that HueQuantize-RG is actually useful. I’ve really loaded this 1.0 version up with extra stuff, just in case. In a nutshell: The senses filter. And this in all kinds of variations. Which also means that, that which is related is by nature incomplete. Or to quote A. Einstein: Reality is a mere illusion, a persistent one. Which by the way also applies to that which is known as history, after all there is no such thing as a solid object, but believing there is, is enough to have that experience. Now I’ll have to rehearse what the rotated colors “mean”, so I can make sense of the instructions that talk about those stupid multicolor LEDs. Yeah, almost by definition the R/G mode is awful. My thinking is that even slight hue rotation should be better than weird games in RGB space, but you’re ground truth. Which is better? Rotation or copying R into B? Oh, one more question: How hard would it be to add digital zoom? The camera resolution is a lot finer than the screen resolution, and it would be nice to have a mode that works for reading the flashing multicolor LED on the projector on the other side of the room. Double Tap is already implemented on iPhone. It will eventually come to Android. In the meantime, pause/play is there. Wow, this is amazing, Dan. Btw, can you use this to see how a tetrachromatics might view the world for us trichromatics? I have no idea how the tetrachromats see. They’re half color blind, half not, which means they’ve got an extra spectral peak. Very interesting. I thought I’d heard somewhere that there were no actual confirmed cases of tetrachromacy, that it was only a theoretical possibility. Did I hear wrong? Do you know of any studies that have found evidence of true tetrachromats? Oh no, the tetrachromats definitely exist, in that it takes four light sources for them to match colors instead of three. But what’s happening is that half their green receptors are “color blind” from one parent, and half are not from the other. To be clear, all pure greens, light and dark, always look green? Never some pale gray or red? Uhm. How would I know? I mostly prefer green-magenta for these essentially dichromatic cases because green and magenta are fairly closely matched in luminance (Y’=0.3R+059G+0.11B) and in apparent brightness. On the other hand, bright saturated yellow is much brighter than bright saturated blue, and bright saturated cyan is much brighter than bright saturated red. I call myself “red green color deficient”. 1) to use this app I need to take a photo on my iPhone, then look at the photo? So, it would not help me watch the Star Trek film, or to enjoy a walk in a public flower garden real time. But if i KNOW I’m missing a color, I can take a photo and then look. 2) Also, someone said “we can now see what others see.” Not how I’m reading this. We can now DIFFERENTIATE what others differentiate, but it doesn’t mean we see it the same. 3) Am I right here? For a green I can’t see, the app turns it into a green I can see. So in theory, if there are 2 fields of green, one is the pre-adjusted green, and the other is the post-adjusted green, they will look the same to me, but different to people with normal vision. But, this is a good trade-off compared to confusing green with either brown or red. 1) DanKam can process your photos, but the main mode is video. Point and see. However, the filters are pretty strong, and I don’t think I’d want to watch a movie through them. 2) There’s some weird things going on in the visual system. I’m not saying things look the same, but we’re not actually seeing all that many hues. I’m really trying to present to you the right hue in the right case. It’s a start, I agree, but hopefully it’s useful. Let me know! Dan, I’ve just passed the Isihara test here( http://colorvisiontesting.com/ishihara.htm ) with 100% using the Daltonism setting with the slider on about 66%. I normally score zero. Aside from the fact that I have tears in my eyes and am feeling like a new person I also want to help make this better. My feeling is that we need some sort of test so that colourblind users can adjust the settings so that they not only distinguish colours but so that they can get more of an idea how others might see them. Maybe a way they can work with a person with normal colour vision to set the app up. I get the feeling that with the settings I currently use ‘normal’ greens are coming out very dark, and reds are going more yellow. I’m not sure how I can help but I’ll certainly give you my feedback after using the app for a while. I’m sorry, but it doesn’t really work that well for me. I realise that my colour-blindness isn’t really typical, but I was hoping to tweak it to be usable. Your app sounds amazing, for me as a “color blind”, too. I haven’t a credit card for Android Market. Is there a chance to pay with paypal? this is awesome in so many ways, im not color blind but im still getting the app! Too funny…I just recently did a whole post on the green girl from Star Trek (instead in my reality, I had a potential boyfriend reveal a fetish for women who “Go Green” … I was thinking recycle more, he was thinking of painting me green as in the girl in Star Trek!). This is cool, I am color blind and something you said to the effect of it runs in the family is true. My grandfather is color blind all he can see is black and white. The funny thing is that it skipped a generation my mom and her brother and sisters are not color blind. Me and 2 of my other cousins are and we can see some colors, it’s shades of green and brown and red that I have issues with. A correction device I’m not so sure I mean it’s a great idea but we have gone so long that I begin to wonder “How would I function if I was not color blind”. I am a photographer and I feel that my color blindness helps me bring the world in to a new light for those who are not color blind. Yes me and my mother used to have pretty bad arguments about “matching clothes” but after she found out I was color blind she said sorry and felt bad. But I guess what I’m trying to say here is thanks for creating this I am sure there are a lot of color blind people out there that will love this, I’m just not ready to change. I just bought my very first paid app on the android market. My only question now is: how do you set it up? That seems to be the only thing lacking in the app so far. I wonder if you could create some wizard that shows a plate from the Ishihara tests and has the user select the different modes until they see the correct number(s)? Seems right now it’s a bit of a guessing game to get it right. Also, on the android version, is there anyway you can add a setting to disable the phone from going into sleep mode while DanKam is active? Again, thank you SO much for developing this. Awesome! I’m all for helping anyone with any limited ability! Sadly, I don’t own either type of phone but I would love a basic Windows apps that could do this. In any case, could someone explain how the ‘fixed’ image looks to people with normal vision? I can see the numbers in the image on the right, not the left, but do both images look the same to people with normal vision? Or is there something different about them? To me, the 45 looks ‘pink’ (at least that’s what I would attempt to call it), and the 6 looks ‘orange’. What colour are they really? There’s a couple things going on. The big thing that’s the same, I think, is the greens around the 45, and in the 6. Those have, at most, been nudged a tiny bit. Around the 6, there are some orangey yellows that didn’t get hit too hard. What remains, in the 45 and around the 6, are some muted red-orange colors on the left, that got changed to vibrant magenta on the right. As a result, the colors “pop” much better. Putting it like that makes me wonder if this app could be configured to make everything look all blue-orange and movie-y in real time. Eugh… Why have I gone and perverted this fascinating technology? Excellent app- though I have normal color vision. I’m an artist, and so is my buddy. We’ve always had a terribly time doing collaborative pieces because he’s color blind. He always starts with ridiculously vibrant colors (so he knows what they are) and starts adding layers to desaturate things to a normal level as he paints. My process always starts with gray and layering subtle colors. I can’t tell what the heck I’m working on when it’s in neon-orange, fire-engine red, and golf course green, and he certainly can’t work my way either. This should be a big help. Wow, very cool! I know a ton of people I’m passing this around to… Congrats on being freshly pressed! Wow. Fantastic. I was born colorblind (Red/Green level 2 of 3). I’ve had many “oh that girl is green?” momonets. For a year in High School I wore one hard “red” contact lens. It was quite distracting and didn’t correct the issue. It only aided in seeing that their was a difference in color. I read about the app on engadget and took all of 3 seconds to download it. For v1.0 this is already a well laid out and feature rich app. Funny enough I haven’t let being colorblind stop me from doing what I do for a living. I’m a camera operator and in the passed worked as a grip and an electrition in film and tv prodution. So lighting and color are a huge part of my day. Having a degree in film I’ve studied light and color quite a bit. There are some tricks I’ve taught myself over the years to decode certain life and work situations. Even using color temp meters to double check myself at work sometimes. I have to play around with some chip charts, color wheels and colorbars to find the filter settings that will best help me see as a normal color seeing person may see. I’d also like to use it to isolate extremes or individual colors. This could actually be an interesting tool for people who use and calibrate chroma screens (green/blue screens etc).They don’t have to be colorblind. They could use it to check costumes and set pieces and isolate colors or areas that maybe a problem in post. I’m going to spend sometime this weekend playing with this to see how I can quickly implement it for various everyday and work related tasks. One of the things I’ve enjoyed about buying this app is discovering quite how many people out there are designers, photographers and camera operators who are also colourblind. I really thought I was the only one nuts enough to do this. Mostly I’ve learned what shades not to trust my eyes with and working in a digital medium (until the final print anyway) I get by with numbers and photoshop’s eyedropper (which many people aren’t aware can sample anything on your screen even if its outside of photoshop). I’d love to hear about some of other people’s life hacks. I’ve had a day (minus getting actual work done) with this app and so far I think its great but I think its shifting other colours outside red and green incorrectly and making things over-saturated. Of course its hard to know whether my world is just too pastel normally but the screen seems over-saturated across the spectrum. I want this embedded in a pair of eyeglasses! I just see that who thing as black on white. Even with effort I can’t make out any colour. Do the reds show up as black, grey, or white? I hadn’t even noticed that there was any color in that XKCD until I saw the comment here. I thought it was all just black on white, but now if I look closely I can tell that some of the lines that I thought were black are red. For me, the red doesn’t look any different. I think because it’s such thin lines and such high contrast, the red lines blend in with the black lines. The way that I’ve understood my color blindness is as a red deficiency. Red to me looks dark compared to other colors. I also have trouble with blue/purple and green/brown. I imagine both of these would be easier to see if red were more intense to me. In particular, the green/brown problem makes it very difficult to choose good produce (makes it nearly impossible to see when broccoli is bad). I think that this is an excellent use case for the application and will probably try that out today. I’m glad that I’m not the only one who has a very emotional response to this. It can hurt when people respond with an amused fascination… the “what color is this?” questions that always follow. I don’t think people understand just how frustrating it is. Thank you, Dan, for turning that fascination into something potentially useful. Thats cool. Green lady. Funny! Haha. I’m not color blind, but my dad and three out of my four sons are too. Very cool that you are doing this! I will pass the info on to my boys. Thanks! I don’t have a iPhone but he does. No, I don’t need it for that. Though it is a minor problem, I do feel abit sorry for colour blind folks since this world is meant to be experienced in full colour. I met an engineer who was red-green colour blind which meant for him, reading engineering drawings was a challenge. I’m not certain what he did to cope. By the way, does my blog look pallid to colour blind folks here? By coincidence, my whole blog template design includes dominant colour of natural green leaf foliage, burn orang-terra cotta colour background, etc. Let me know. Admittedly I like the colour combinations because they evoke the natural world. This is so interesting to me. I’m not colorblind, but my brother is. I have often wondered what it would be like to see the world through his eyes. Now, based on the pictures here, I have some kind of idea. Not the complete picture, mind you, but some kind of idea. (Descriptive words just haven’t done it for me… I wanted to SEE what it was like. Temporarily, of course. I’d never want to be colorblind). My *deaf* cousin has more musical talent in her pinky finger than I, a hearing person, has in my entire body. She is a drummer and a violinist. As far as the violin is concerned, I am violinist and an avid listener of classical music, and can definitely tell you the finer points of the cello vs. the violin. I cannot imagine my life without it classical music. I’ve been playing violin for 20 years. She’s been playing for 5. She’s better than I am… and she’s deaf. I’d love to know more about how your deaf cousin plays violin. Do you think you could ask her to write up her experience of playing the violin? What she senses, what she thinks? Dan, I asked her if she’d write about her experiences, but she declined. She’s 15 and not interested in writing anything other than what her English teacher requires her to write. Based on conversations we’ve had in the past, though, I can tell you that for her, it is very much about FEELING the music. To a hearing person, this makes obvious sense when it comes to drumming. But with stringed instruments, most hearing people don’t much notice the difference in vibrations between the cello, violin, or guitar. She can almost always accurately tell which instrument is being played (live and solo) by the vibrations they make. She can’t hear music the way we do. She does wear hearing aids, but those are mostly to alert her to loud noises (car horns and such)… so for her, it’s all about feelings (vibrations and how those vibrations make her feel) and also the mathematical aspect of music. I downloaded yesterday and have been playing with it a bit, not tons. I’m not really “getting it”. With the Ishihara tests: I can appreciate what’s happening, becuase (only) with filters, I can see the numbers. Great. But, looking at other things, I don’t know when I’m seeing something that normal-vision people always see, as opposed to odd interference. Example: some images have a lot of spots on them. I think that’s some type of light interference. I tried various filters on some of my photos, and sometimes I don’t see a difference between unfiltered, hue quantitize, and hue quantitize RG. What does this mean? Am I seeing this scene normally? Is my vision so far off that I’m missing things on all 3? I’m surprised by this because it’s a nature scene in Yosemite, and thought I just miss be missing some greens. I’m confused. Given that touching the slider changes what’s green and what’s red, can I reallly guess at what’s more like what normies see? Finally, my app has this bug on my iphone 3GS run os 4.2.1. I push the Source button, and the wheel of choices starts with Back Camera twice. Clicking the 2nd Back Camera brings up Ishihara 1. All the remaining choices pick up the choice below it, not the choice labelled. We’re fixing the 3GS bug you found. Can you send some screenshots of the images you describe? Do you have any details on your precise form of color blindness? I haven’t had anyone who saw Unfiltered and HueQuantize as identical. HueWindow is your “ground truth” finder — compare there, and you can start understanding what you are or aren’t seeing elsewhere. I’d love if you could mail me some info about your vision. I only have a limited sample set so it’s great to find people the defaults aren’t working quite right for. i like this beautiful science. – just another ‘ism’ ! Fascinating! You’ve helped an awful lot of color blind people. Now can you make one for those who lack stereo vision? PS: Congrats on being FP – it’s a great rush! Congratulations to you for thinking outside the normal “hacker” and “developer” boxes and making something that benefits people who need help. How does this compare to the chrome plug-in (Chrome Daltonize!)? I’d love to hear from someone that’s tried both. The plug-in doesn’t do much for me (still can’t see all the numbers in the color blindness tests). I very much need something like this as a browser plug-in, for viewing scientific data. It’s much better. The Daltonize algorithm is included, but HueQuantize is much nicer. I’ve been working with another researcher on something of a “biology” mode, to deal exclusively with Red vs. Green differentiation. We actually implemented 48 bit PNG support just so we could filter images from PLoS! this is absolutely fantastic. i will recommend this app to my color-blind boyfriend. congratulations! Hi Dan, i’m color-blind, and i have an HTC Touch Pro2 (Win Mobile). Have you notice about an application looks like yours for mi platform? Dan Kaminsky :Do the reds show up as black, grey, or white? The red lines appear black to me – while I sometimes think I may be able to tell a difference between some of the lines, I’d not be comfortable committing to it, and I’d certianly not put money on it! Wow! What happens when you view the images through DanKam? I imagine nothing? I haven’t had time to buy a smartphone yet, so I don’t know! And just so you know how important your app is to some of us, I am actually buying an Android phone solely because of DanKam. Sure, it’s useful for other things as well, but DanKam justifies every penny spent. I’m out to fix the Internet. Hehe. It’s kinda fun, flipping from DNSSEC to DanKam and back again! Do you think this will allow me to pass the test at http://www.testingcolorvision.com? They’ve been using this test at my work and I want to see if it will work for me since I’m colorblind. It’ll definitely help you pass, but whether you work will let you use it to pass is another story entirely. I am colour blind. I can see nothing in the circles on the screen (presumably the free test) at http://www.testingcolorvision.com without the application. With the application I can read the numbers easily. I don’t want to spend money to do the tests for which one has to pay. Yeah, so you’re not color blind, are you? Hue quantization, for reasons I’d love to know, has a hugely significant effect on perceptibility. Daltonization is just not that effective (though I think I want to add a daltonization + saturate mode, for exploratory reasons). Yes, I am actually, which is why I mentioned Daltonize. They developed an app about five years back that did real-time colour shifting for video displays. I like the sound of your Android app though. Does it run on OS 1.6? I’m not colorblind, but I bought your application from Android Market, both to kick you back some bucks and so that in case I need it, I have it. Wonderful work. Thank you very much for working on this kind of thing. It makes the world more wonderful. Anyone who likes this should also check out EyePilot http://www.eyepilot.com — a similar product aimed at computer screens, which I’ve been using for years. DaNKam and EyePilot are both nice programs, but what I REALLY want is a program that will make certain colors PULSE — say, brightening and darkening a pixel to a degree proportional to its redness, while leaving everything else unchanged. None of these programs take advantage of time, but I think that a judicious use of time information, e.g. pulsing intensity, could go a long way towards making up for the limited number of colors eyes like mine can detect. Just a suggestion; I’m grateful for what you’ve done already. probably end up to distinguish those numbers, but not to fix the defeat. I’m red/green colorblind and just wanted to let you know I’d happily pay for a PC version. It surprises people when I tell it’s not just red and green which are off. There are countless pictures I’d love to try this out on, but I most recently came across this one: http://sente.cc/colorblindness/pie-chart.png (taken from http://www.codinghorror.com/blog/2011/01/trouble-in-the-house-of-google.html), in this picture I cannot tell the difference between reddit, hackernews and google’s colors. could you (or anyone?) post what the software does to this image? Shoot me an email if you’d be interested converting more images. My brother emailed me this image: http://sente.cc/colorblindness/Crab_Neubula_from_Hubble_Telescope.jpg saying it would probably be a good one (he’s not colorblind). Saw your app mentioned online, and couldn’t download it to my ipod touch fast enough. With just a bit of twiddling, I could spot the numbers in those damn Ishihara charts! I’ll play a lot more in the next few days to get it dialed in for my eyes. For a new organization, you’d think they would know how to white balance a camera. Hi Dan, I bought Dankam and tried it on my friends iPhone…IT’S FANTASTIC!! Colour-Blindess is THE forgotten disability. Most people have NO idea just how debilitating the condition can be!…L.E.D.s, Colour-coded maps, wiring, the list is long. I have a Nokia 5800 and will gladly buy DanKam again if it’s available for the Nokia. I TOTALLY agree with another poster…you deserve a Nobel Prize!! I am partially color blind. Reg-green I think. Being involved with IT, I get asked all of the time, “Is the light on the ____ red green or yellow?” No frigging idea! I bought the app for my droid, and have been playing with it for almost 2 hours. On opaque objects, HueQuantizeRG seems to work best, with the slider about 90%to the left. But I still can’t tell the difference between those damned LED lights that change color. Is there a proceedure to follow on how to best adjust the settings on DanKam to compensate for ones eysight weaknesses? I have been just using trial and error and have not stumbleed on anything that I can rely on. I’m a colorblind artist. Oil paintings. Your app helps me greatly. …but your color wheel is flipped. The traditional art world wheel places primaries where as red is at the top, yellow is bottom right, and blue is bottom left. I realize this is traditional computer wheel but for me I have to perform a mental step to convert to a space I can understand. Is there a possiblity to offer both color wheels? Colorblind artist. I forgot to show samples of my paintings. realism is not easy for me. Very interesting app,. Don’t have an I-phone but hope you will consider to bring it out as an independent unit. The “green” population will appreciate that and would not have to turn red when they are outed for being colorweak (that’s how I prefer to call it. Have some interesting anecdotes. 1) Supposedly (I have never had that officially confirmed)the allied airforces during WW2 hires the green/red colorweaks as observers in their recognition and fighterplanes since, as electronic technology had not been developed yet observations were made with the naked eye or binoculars and they were able to make a distinction between life foliage and dead foliage i.e. camouflage nets were used by the armies on the ground and after the foliage they used for that had died they were not always replaced. Maybe somebody can confirm that this was the case. 2) Made a stupid mistake when I was driving and passed through a red light. I told the policeman who stopped me that I was colorweak and that that was the reason for my mistake. The policeman told me that I should never use that as an excuse because he could withdraw my driving license. He mentioned that, if I would have a problem with the lights, the top light of the traffic lights is always the red one and that this is the case worldwide. Not recognizing fine red lines on a white background (i.e. seeing them as black) is quite common among anomalous trichromats, I think. The first time I realized that, was when I used Microsoft’s Encarta encyclopedia many years ago on my PC. It took me a few months to find out that there are actually very many links in each entry, just because the mouse pointer suddenly changed hovering over a word. All those links were dark red. Luckily, there were options to change that color and I set it to blue. Wow, now I could see everything! Looking at this XKCD image mentioned above, I only see the red lines when I try very hard. And even then I’m not quite sure. I haven’t tried it yet, but is there a way to change a dark red color, e.g. words in a text to something else, preferably blue, using your app? Are those lines red? I also seem to see them as black ._. I have profound reg/green color blindness. I am having trouble just figuring out how I am supposed to use DanKam.. it there a user guide for the color blind.. I have no idea what I am supposed to be seeing.. how does this help me tell purple from blue? How does it tell me what it green when I can’t see green??? I love the idea but don;t see how this is supposed to be helping me… .. I’ll keep searching. 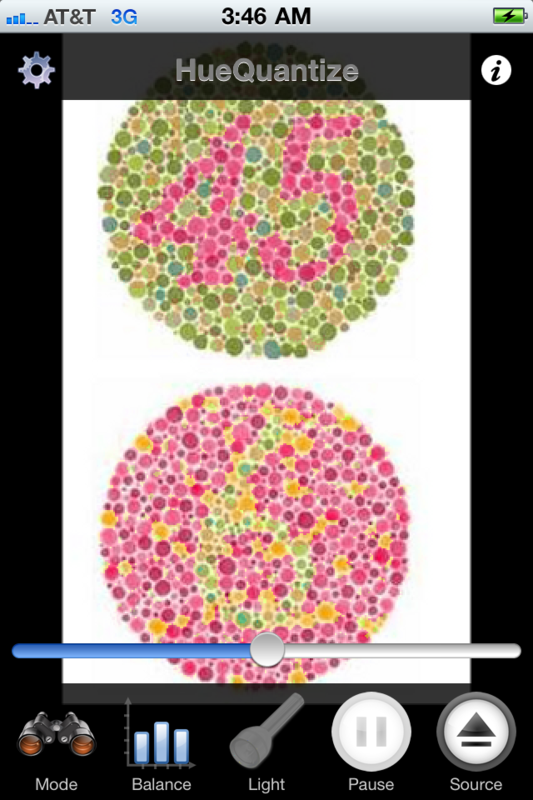 I know the pain and frustration of color blindness. I also know the pain and frustration of not having an iPhone. Please make a version of this app for BlackBerry! Hi, haven’t tried it yet but will. Two initial comments: 1being colour blind isn’t bad, it probs makes us better hunters! 2Following on from that… As a colour blind linguist… it is naming colours to those unfortunates who don’t see the world as we do, that bugs me most. And 3 (I added one) designers should know this stuff!!! we spend millions on lifts and ramps an electronics for many disabilities, QUITE RIGHTLY, accommodating the 10% of us who are colour blind only requires good design and costs nothing! WELL DONE DAN THE MAN!!! I have tried to load this on my 4s nut it will not load. I was using it for a while on my first gen iphone and loved it. Thanks. Now that the Blackberry PlayBook will run Android apps, will you be creating an Android version, please, please, please? I am green weak colorblind and I really do need your app. Apparently all that is required for Blackberry to add it to their app world is about 10 minutes work on an android version, linking it to their API instead of the android one. Looking at the success you are having with the I-pone app I wonder if there is a solution for the following: I am using a Sony video camera with onscreen information about the actions. The REC (for recording) sign is in red print and the stdby (standby) is in green. It has now hhappened several times to me that I have not been able to read these signs at all because they were very vague or that I have confused one with the other because of the background light etc. Has anyone experienced this also or should I approach Sony and ask for a remedy.? Are you colorblind? Treyarch loves you!